I distinctly remember the day I found out I was pregnant. There was shock and disbelief, quickly followed by exultation. And then began the scouring for information. There was always something new to read and a new milestone to look forward to. My baby is now the size of a bean. Baby has a heartbeat. I can feel movement. The kicks are getting stronger. I am that big, I can barely breathe! I had lots of details available on the internet and there were books to read. What I would have really liked was something bright and entertaining to look at as I traversed this most incredible of life's journeys. Something fun and cheerful. 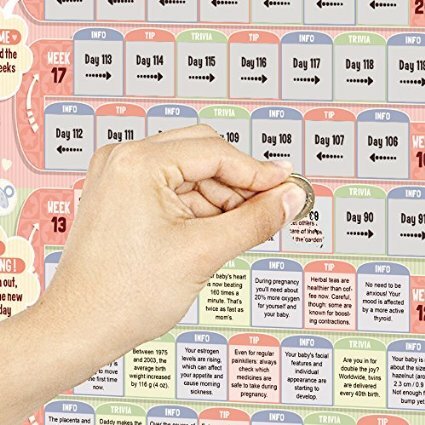 The BabySteps Scratch-Off Calendar by Splash Brands is just that. It is bright, it is beautiful and it is packed full of interesting trivia. Splash Brands are known for their unique and quirky gift ideas. The BabySteps Scratch-Off Calendar keeps up with that trend. It is like an advent calendar for pregnancy. You scratch off a field every day. Instead of chocolate, you get an interesting bit of pregnancy trivia, 236 pieces in all. It takes you through your pregnancy from week 5 to week 38. Weeks 5 to 8 have been left uncovered, the scratching-off starts from week 9. The BabySteps calendar offers tips, information and trivia, and is designed for a bit of fun along your pregnancy journey. It is not meant to replace any professional medical advice related to you or your pregnancy. The calendar is printed on thick gloss paper. There are cute pictures dotting the edges and the whole sheet is covered in pretty pastel blues, pinks, peaches and greens. It comes housed in a hexagonal gift-box that is as carefully designed as the main calendar. I think it is a great gift idea for any new parents-to-be. It does not occupy space; you simply stick it neatly to your bedroom or nursery wall. Splash Brands has kindly offered to give one of my readers the chance to win a BabySteps Scratch-Off Calendar. You can keep hold of it if you are pregnant or expecting to be, or just gift it to a loved one. You can enter via the Rafflecopter below. Good luck! 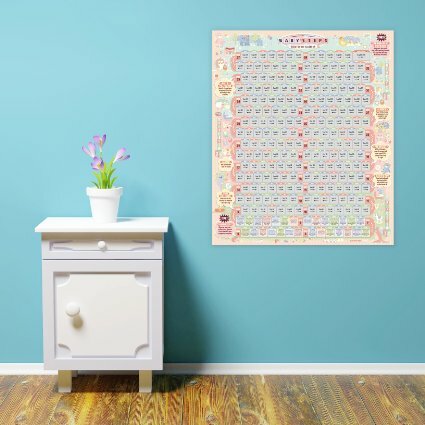 If you want to get a BabySteps Scratch-Off Calendar right away, they are available on Amazon for £12.90. Disclosure: I was given a BabySteps Scratch-Off Calendar for this review. All opinions are my own. This post contains affiliate links. This is such a fantastic idea! I would have loved this while pregnant. What a great idea! I've never heard about calendar like this before. This is such a lovely idea - and it looks so cute too! I wish I had had one when I was pregnant! This looks great fun for a new mum! I would have loved it whem I was pregnant!